There is a large pool of potential volunteer leaders in your area right under your nose. Many have a vibrant faith, love teenagers and all of them are on campus doing contact work every day. Who would that be? Teachers!! Do you actively seek out teachers to be members of your team? Do you do contact work with teachers, seeking out believers, striving to know them and helping them to become missionaries to their classroom? I highly encourage you to do this. Teachers do more contact work with kids day in and day out than you or I would ever be able to accomplish. Partnering with teachers to know more kids will help ministry grow and go deeper. During my 11 years in the classroom, I found myself connected much deeper to kids than my 10 years as a non-teacher volunteer or my last five years on full-time staff. Our area has been blessed to currently have over a dozen teachers actively serving in my area. Some of these teachers simply lead a Campaigners group, while others serve in a full-on capacity. Many of our teacher-leaders have a minimal role in club but a considerable role in introducing our other volunteers to kids from their classroom. When allowed, our teachers champion club and Young Life events. In more closed schools, they merely introduce kids to leaders at after-school events. I spend much of my time with teacher-leaders, encouraging them on how to be intentional with kids. They can spend one passing period per day being intentional in the hallway. They can use their before-school duty station to start conversations with kids they don't know well. They can spend one planning period per week connecting with other Christian teachers to pray for the school. Imagine what happens when a new teacher catches a vision to invite a cabin full of kids to summer camp. Much of the expectations for teachers is the same as is is for my other leaders, but some of it is more flexible. I seek to be intentional to avoid events during busier school times (quarterly exams, meet the teacher night) or not expect to see them at club on those days. Ultimately, I discovered during my time as a teacher-leader that ministry gave me life even when I was overwhelmed by my teaching load. Being connected to students deeply through the Young Life ministry gave me a greater purpose and led me to pursue my calling versus just having a teaching career. Leading Young Life during those years kept me in the classroom for years longer than if had I simply been teaching my subject. Seek to help teachers find their calling and fulfill the calling to truly be missionaries in the classroom through the mission of Young Life. For more information or resources for connecting to this vast pool of potential volunteers in your area, contact Carrolton Area Director Michael Cone at younglifecone@gmail.com. Learn more about teachers in the mission HERE. Football has started, kids are in school, and fall is in full swing. Of course the reality of Young Life is that “fall” is in full swing by mid-August. Here at the “beginning” of the year I’d like to offer a few thoughts, things that might make your year more productive. An idea that has captivated me recently: Kaizen (the term means small continuous improvements). After 100 yards, you'll be off by 5.2 feet. Not huge, but noticeable. After a mile, you'll be off by 92.2 feet. One degree is starting to make a difference. After traveling from San Francisco to L.A., you'll be off by 6 miles. If you were trying to get from San Francisco to Washington, D.C., you'd end up on the other side of Baltimore: 42.6 miles away. Traveling around the globe from Washington, D.C., you'd miss by 435 miles and end up in Boston! Sometimes this is called “1 Percent Improvement.” Over time, 1 percent can make a big difference. The question is: WHAT 1 percent are you going to focus on? What small thing could make a big difference for your area, committee or club next year? What would produce the greatest impact if you focused your energies on a few critical small changes*, and didn’t get distracted by the hundred loose ends tugging on you daily? *Notice I didn’t say “easy changes,” (they never are), and you have to stay with them doggedly to get the benefit. ACTION STEP: What if next year … ? You spent more time planning committee (or club) meetings and always finished on time? Every adult meeting started with a great devotional, a kid sharing, or a leader giving a ministry update? A group of adults prayed for club every week? You identified the 10 most important donor relationships for the area and did a great job thanking them and keeping them informed? You identified the three critical things that would make your area/club better and focused on that till it happened? You get the idea. I don’t know what your 1 percenters are, but you do. Think about it. It’s worth it. A lot of people are focused on football right now, but I’m thinking, what will be the few “1 percenters” that will be my highest priority this year? When we kicked off the GLOBAL CITIES FELLOWSHIP PROGRAM in Hong Kong we felt like we were getting ready to live a season of MTV’s Real World “Young Life Young Life.” We didn’t know exactly what would happen if we put three 22-year-olds from all corners of the earth in one global city to live and work together for two years. It had the potential of getting messy really quick. What happened was nothing less than a miracle and far exceeded our hopes and dreams! There are primarily two needs of every Young Life area: 1) People, and 2) Resources. 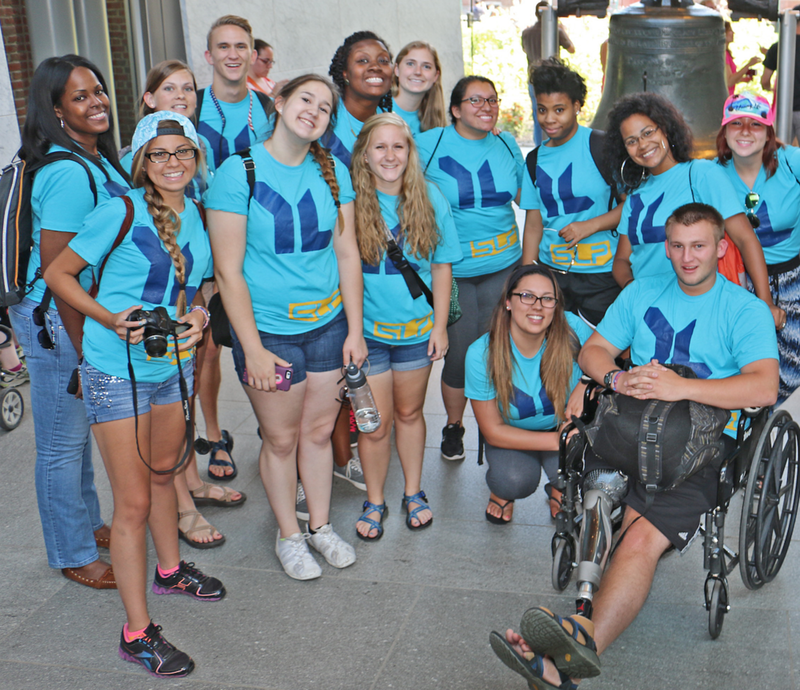 Since Hong Kong Young Life’s beginning five years ago, our biggest need has been — PEOPLE! People who understand Young Life and the unique culture of Hong Kong. We had open doors at schools but didn’t have the people to walk through those doors. Since we were too young to have “grown our own,” we needed to find a creative solution, which birthed the Global Cities Fellowship. The fellowship was initially a two-year program designed for young people with Young Life experience to come to Hong Kong to be team leaders and be a part of a training leadership program all done in community to eliminate loneliness and build a greater sense of team. Time, Experience, Responsibility, Community and Fellowship became some of the tenants of this program. We expected to have all Americans but ended up with one American , one Thai and one of Nigerian-British heritage. We couldn’t have designed things any better. Why? Because of their intentional community! They each were able to bring and share their knowledge and experience of Young Life, Hong Kong culture, and youth culture. Each week they spent three hours in training together growing in Christ, learning Young Life principles, and discussing how to implement them in Hong Kong in their individual school context. They also lived life together — shared apartments by gender, socially hung out, were inclusive of each other and treated each other like family. We learned that the combination of experience and background was far greater than just having people come who know Young Life. The fellows’ diversity has made us a much stronger team and continues to breed more diversity and unity as we identify future cohorts. “How good and pleasant it is when God’s people live together in unity” (Psalm 133: 1). The benefits far outweigh the costs of the fellowship, but they are still a reality. Hong Kong is the third most expensive city in the world, and providing housing for the fellows is expensive. Also Hong Kong Young Life currently carries a majority of the burden of their cost as opposed to the traditional Young Life sending process, and your situation may be different. That being said, the fellowship answers our need for a pipeline of staff associates and helps us “grow our own” faster and develop a rich environment of diversity and cultural understanding, making our team stronger together. Cohort 2 (Hong Kong Young Life Season 2) launched this past month with the orientation of three more fellows each with their unique background to Young Life, Asian culture, Hong Kong school culture, and Hong Kong culture. We are excited to see the outcome of this group’s community. There is a cost to community — but it is a small price to pay! If you are interested in talking more, please feel free to email me at suzanne@hongkong.younglife.org. Some other useful information Hong Kong Young Life Website — GCF or follow them on Instagram at younglifegcf. The Location: According to my handwritten directions — the house 5 miles down a county road on the left-hand side just passed the split rail fence. The Purpose: Interest meeting to start Young Life. The Agenda: Starting club at Mackay Junior/Senior High School — enrollment: 92. 3 dogs were left in trucks parked outside. For much of my more than 40-year career with Young Life, this has been my life. It involves driving a few nights each week from small town to small town all over the Western United States with names you have never heard of and on county roads you have never been on. It involves traveling with the hope of getting to talk with people about bringing Young Life to their community. One of many pivotal moments was at a Young Life interest meeting sitting in Hilda Goddard’s living room one fall evening. “We need to tell our neighbors in Challis, Idaho, about this Young Life thing!” was the reaction of Harold, (one man in attendance) at the end of the night. I soon discovered that the “neighbors” in Challis lived at least 60 miles away! My understanding of the word “neighbor” began to grow that night. The gap of distance was overcome by the closeness of circumstance. Even internationally, I have been struck by the countless villages, townships and small towns dotted all around the globe that share common traits and challenges. My constant prayer is that there are people in these places who will reach out to these kids to love them, walk with them and tell them about the hope that comes with a faith in Christ. Harold, whether he knew it or not, shared the heart and vision of Jesus. He understood how God works through the ministry of Young Life to not only transform individual lives of students who attended Mackay Junior/Senior High School, but to a greater extent, the entire community. The book of Matthew tells us that “Jesus made a circuit of all the towns and villages. He taught in their meeting places, reported kingdom news, and healed their diseased bodies, healed their bruised and hurt lives” (Matthew 9:35, MSG). Jesus wanted His message to get to everyone, so He went places most people would pass by. He had a heart and vision for the next small town! We pass by our small towns and villages every day, giving them very little thought, but there are so many! Here are a few interesting observations that I have learned in the past year. In the United States there are 18,025 small towns. There are over 32,000 schools in small towns; 18,000 are secondary schools. 21 percent of the U.S. population lives in small towns. 94 percent of the total square miles of the U.S. (3.4 million square miles) are considered rural. At-risk behavior statistics in rural communities are identical to urban centers. Here are some facts that you won’t find on any U.S. government website. Many small town high schools adjust schedules around the harvest or hunting seasons. The nearest Walmart may be over an hour away. The local high school may have special parking for students’ tractors or horses. It is a community event when a new fast-food restaurant opens! Young Life leaders have been known to reschedule summer camp dates to not interfere with the County Fair. … And there is a pretty good chance that you have a small town “neighbor” right down the street within 60 miles or less. So what do you do? Four steps to think about the NEXT school! — Ask your committee, leaders, friends, who knows somebody in these towns? TRY THIS: Contact Young Life Alumni & Friends to help you find people in town who may have a Young Life background. Make some calls to pastors, civic leaders, and business people. eXtend a Hand — Get a leader, a committee member, club kid, friend and make a road trip! TRY THIS: Go to the town; spend time in the community. 1. Pray at the school. 2. Eat at a local restaurant. 3. Meet with a local pastor. Take the Next Step — Mobilize someone in the town to host a meeting of people who care about the kids in their community and need to know more about Young Life. You can check out the Small Towns Tool Box to give you ideas for this meeting. There are Small Towns everywhere we go. Slow down, take some time to notice them and then do the NEXT steps. Email me if you would like to receive the Small Towns Newsletter or would like to attend the Small Towns Summit in December. To learn more or if you have any questions, check out the resources below for help.